At the close of the Second World War, as cities and towns were recovering from the devastation of bomb damage, there was a very real need to find homes for those who had lost theirs and for soldiers returning from the front lines. Luckily, the government was not blind to the problem and turned to an innovative and as yet little-known method of building – prefabrication. 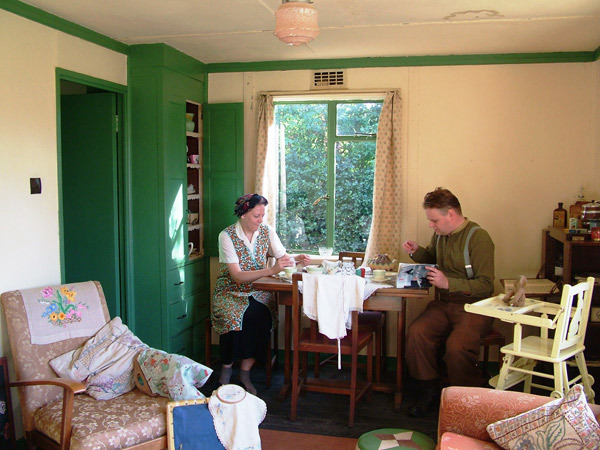 A quick fix was to build large numbers of temporary homes – or prefabs – that could be made in factories, speedily trucked across the country and bolted together by workers, often German and Italian prisoners of war, in a matter of hours. More than 150,000 of these jaunty one-storey homes rolled off the factory production line (although Churchill had plans for many more). At first somewhat suspicious of these new-fangled homes, residents soon grew to appreciate their new digs – finally, a home to call their own. And what a home! 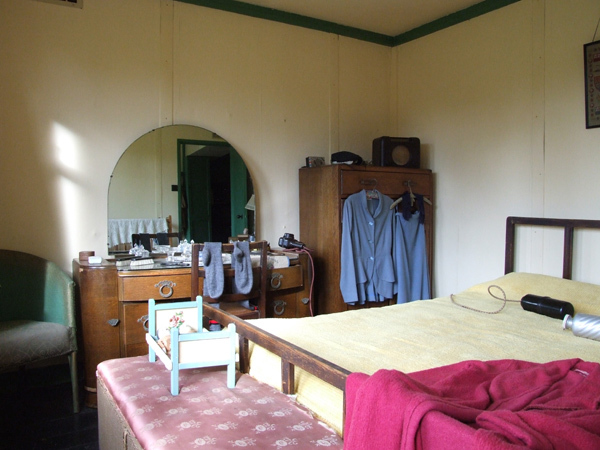 Every prefab had two bedrooms, hot running water, an indoor toilet and often a gas-powered fridge: mod cons that many could only dream of in war-time Britain. No wonder, then, that the prefabs became so loved. 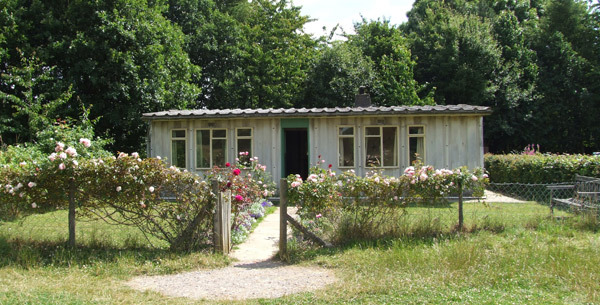 They were meant to last just a decade – a mere stopgap as the country got back on its feet – but many of the prefabs are still standing, with residents often fighting to hold on to them. 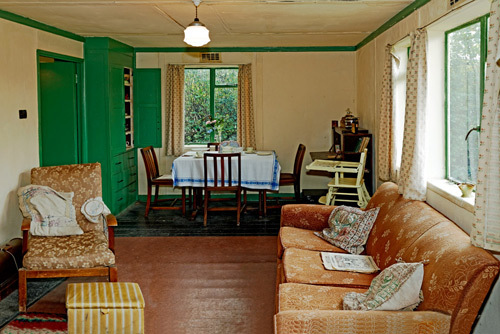 “The spacious bedrooms and living room, the integral drawers and cupboards, the huge windows the large garden and Anderson shelter coal shed were, to us, more palace than prefab,” recalls Neil Kinnock, who grew up in a prefab in Tredegar, south Wales. Each prefab had a generous front and back garden and it didn’t take long for tenants to start using this new-found space to grow fruit and vegetables. The government encouraged this – How To Grow Food: A Wartime Guide helped people adapt to austerity, and the wartime Dig for Victory campaign was still on everybody’s minds. 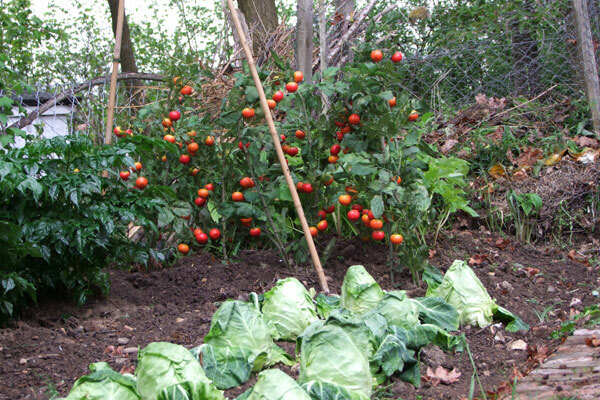 Also, growing fruit and vegetables was necessary – in 1947, bread and potatoes were rationed for the first time. Many supplemented their diets with apples, raspberries, gooseberries, strawberries and blackcurrants grown in their back gardens. For those unfamiliar with gardening, help was at hand: the Women’s Voluntary Service (WVS) Garden Gift Scheme began in April 1946 to brighten and smarten up newly built prefabs, which often stood on little more than barren building sites or land only very recently cleared of bomb debris. Through the scheme, WVS volunteers collected plants and seeds from donors, often in the countryside, and delivered them to new residents. The popular WVS scheme asked for flowers, vegetable seedlings, shrubs, trees and hedging plants. It was taken up with such enthusiasm that a prefab garden even featured at the Chelsea Flower Show every year from 1947 to 1955, exhibited by the Women’s Voluntary Service. The WVS prefab garden included a replica of a prefab made from felt and stucco and the approximate amount of land usually allotted to a house. The exhibits aimed to demonstrate to visitors the best way to gain the most from their prefab plots, while showing how the gardens could be used as a means of self-sufficiency. 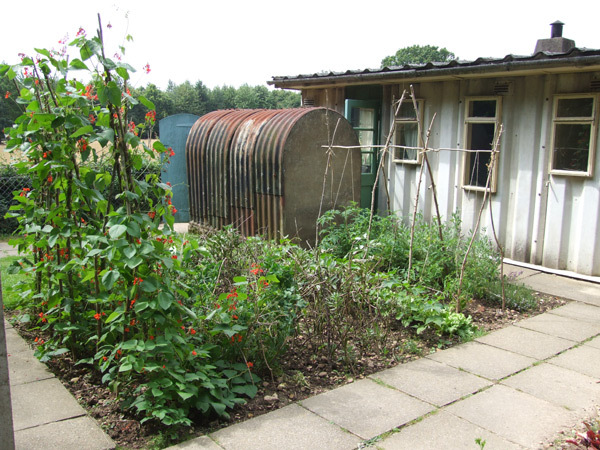 The prefab garden was planted with all manner of flowers, along with a vegetable patch that included herbs which, during rationing, really drew interest from the crowds. The prefab exhibits proved to be a tremendous success and helped spread the word about the Garden Gift Scheme. And in 1949, the Queen Mother even sheltered in the prefab when an inopportune rainstorm hit the Chelsea Flower Show. Visiting prefab gardens was very much part of the royal calendar. On 30 July 1947, Princess Elizabeth visited bombed areas in southeast London with officials from the London Gardens Society. “She particularly admired the prize-winning garden of Mr WC Bodger, a railway foreman, and asked if she might inspect his prefabricated house,” reported the Illustrated London News on 9 August 1947. Queen Mary was a particular champion and often visited prefab gardens in London. The WVS even ran a competition, offering a silver trophy presented by Queen Mary to the best prefab garden. A Mr and Mrs Hale won the prize in 1947 for their prefab garden in Bethnal Green. By the early 1950s, with the fear of rationing receding, prefab tenants converted parts of their gardens into a play area for children or into elaborate flowerbeds. Slowly, front gardens were given over to lawns and flowers, a sure sign of social stability. Gardening became a shared hobby among prefab residents. Typical estate layouts, with footpaths, alleys and low fences, encouraged people to look at the neighbours’ efforts and there was certainly a healthy sense of competition. Best garden layouts and flowerbeds garnered prizes and residents were not shy about sprucing up their green spaces with wishing wells and even the occasional gnome. At the start of my last blog, I remarked on the three whole months that had passed since I last wrote something for our website. That blog was written in the early months of this year and published in March. That was six months ago – I appear to be getting worse! 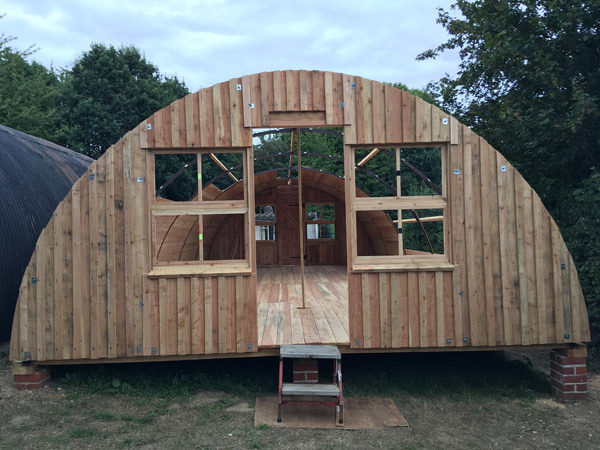 Anyhow, moving swiftly on from my optimistically overestimated number of blog posts, to what the Buildings Team have been getting on with this year, and what I, the Buildings Trainee have been doing to get in the way. Since March, I have unfortunately had a significant amount of time away from the museum due to ill health, however since being back I am hoping to make up for the time that I missed. 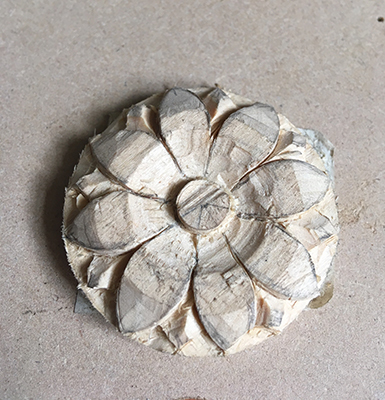 As it was my intention at the end of the last blog to explore the decorative side of conservation work, I have joined Colin and his team on one of their evening woodcarving courses with the intention of following up with some work experience. Although it doesn’t look like much, this piece is the result of the first hour and a bit working with chisels in an official woodcarving capacity. There is a lot of refining to do, however I’m pretty pleased with the outcome so far…it looks pretty much how it’s supposed to! 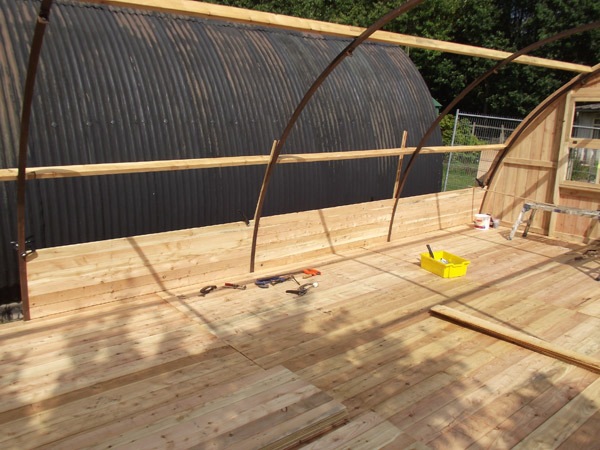 Also planned for this year was starting the elm barn in Tewin, using the timber collected from the woods in December. I attended a course, coincidentally alongside previous HLF Building Trainee Sam Rowland-Simms, and had an amazing time putting in to practice some of my slightly rusty framing skills. Lots of photos were taken over the frantic week working among the sprightly Spring lambs in the scorching* sun and the following snow. I also had the opportunity to re-join the course leaders, including Sam, for two days the following week. We spent those two days going over the previous weeks work, correcting any minor issues and starting the remaining cross frames. *mildly warm, but enough for no sleeves. I had hoped to return to Tewin to continue assisting with the construction over the summer months, however my illness put the kibosh on that. 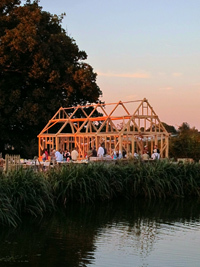 The barn has since been raised and looks spectacular in the September sunshine. Hopefully, I will be well enough to return to help with the cladding, tiling of the roof etc. 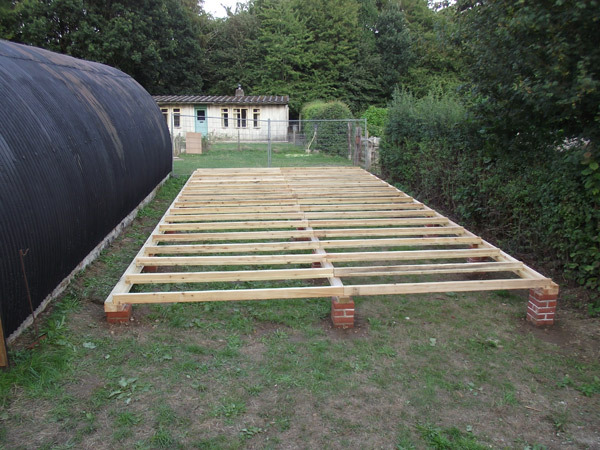 Returning somewhat closer to home, the Nissen Hut project is well under way and construction has commenced. The panels which John, myself and the volunteers have been putting together since the end of last year have started to piece together like a jigsaw…ish. 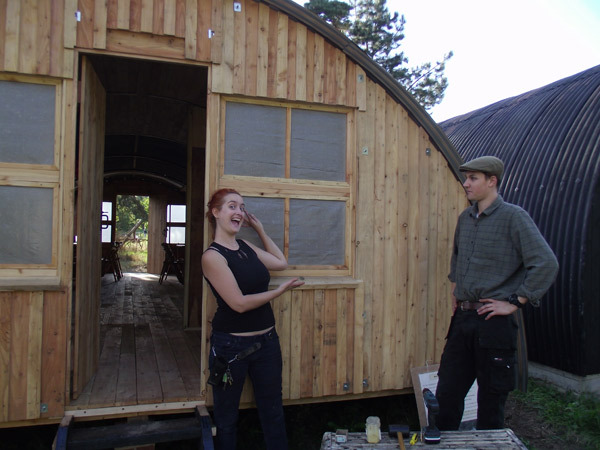 With each passing day, the Hut has grown in some way or another. This is my first build with the Museum and has been so incredibly exciting to be a part of. It was also this day that I decided to treat the volunteers…to a table during break for the paper cups of tea. I do know how to spoil the team! 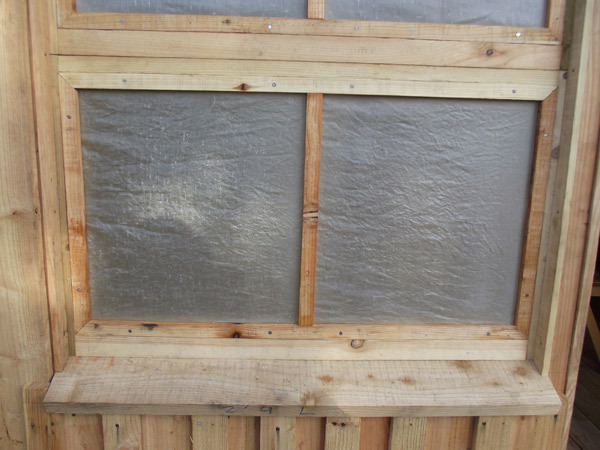 Part of the Hut build that I have had more involvement in is the linen windows. We knew from various records that these would contribute to the most accurate representation of the hut, yet none of us were 100% sure on how to do it. So after I researched oiled linen and oilcloth and determined what was useful for this project, the boss and I had a go at making windows. 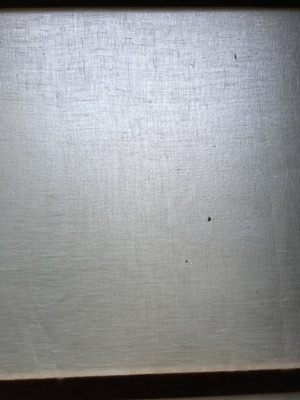 This image shows the difference in the linen after one coat of a 50% boiled linseed oil and 50% white spirit mixture. 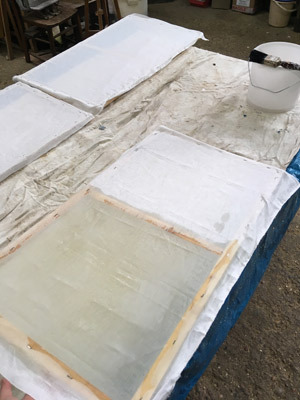 These images show the difference in transparency after two coats of the same mix. After quite a while drying, the windows were then fitted just in time for out Meet the Tommies event weekend in September at the Museum. Conclusion of the oilcloth window experiment is that it worked pretty well and lets in a surprising amount of light to the hut. 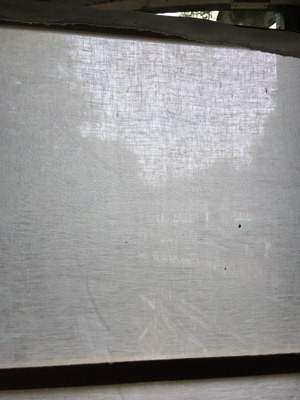 Notes for replacement windows: make the canvas tighter as windows shouldn’t billow! 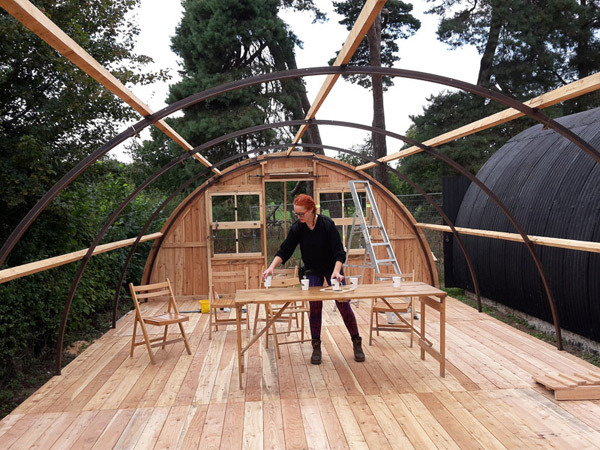 For the foreseeable future, completing the Nissen Hut will be our primary focus, with urgent maintenance and repairs fitting in as and when they arise. The woodcarving course continues in to December, so I shall update you with my progress around Christmas time…no idea which Christmas it will be though. No Lambs This Year – Just Kidding! With the cold and wet weather, it’s been a challenging winter and early spring on the Museum farm. But our spirits have been kept up by the exciting news of this year’s planned new arrivals. Winter arrived early this year when it turned up unannounced last year by gate crashing autumn and refusing to go away until the spring. It certainly tested the farm staff and volunteers’ resolve. 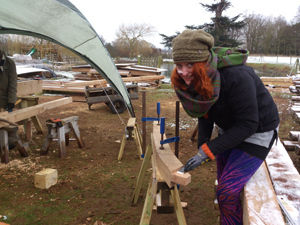 But winter has its benefits for those of us still on site during this period when the Museum is closed to visitors. A ghostly calm descends on the site. Walking around feels like a privilege when few people are about as just the staff and mostly farm and building volunteers continue working at this time. With the low winter sun or when gloomy mists descend, the eerie atmosphere can help you imagine yourself being transported back in time. Winter is a vital time to conduct maintenance and those jobs that are best done at this time of year. But is a challenging time for the Farm Manager and his team, trying to complete seasonal and essential work before the Museum re-opens in the spring. A long list of must do projects are interrupted by the ongoing problems associated with any farm or estate coping with winter weather. And this winter certainly directed a lot of ‘traditional’ winter weather at the Museum with long cold periods complemented by freezing winds and snow. 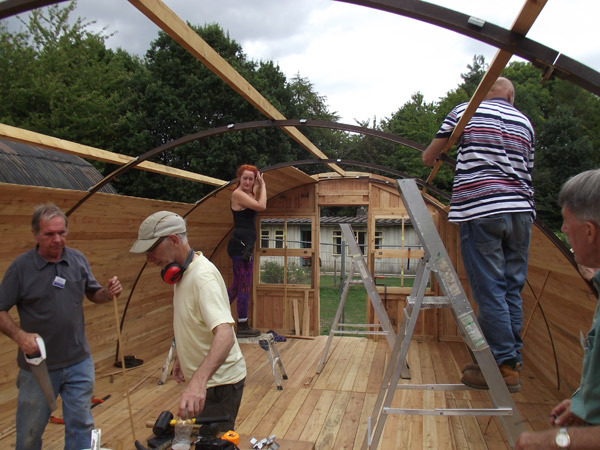 But the farm team and volunteers just got on with the work as best they could. One particular day to remember was clearing Blackthorn that was shading out a hedge that was in the process of being laid. Whilst many people across the South and East of England stayed put in their homes that day, three of us volunteers battled on in sub-zero temperatures to get the clearing done. And even though the weather was spiced up by a biting wind and heavy snow showers, it was still better than being stuck in indoors! And then came spring and the Museum opened just before Easter. But as you probably remember, the heavens opened and the already sodden ground became even more saturated. The Great Missenden Food Event that had moved to the Museum site for Easter, that everyone was so looking forward to, was rained off. The mud devoured anything that ventured on to the site’s fields. It took weeks to remove all that was stuck or buried. This of course put more strain on the farm team which had to deal with the aftermath. The situation was helped by a local farmer who kindly brought in his modern farm equipment to speedily restore and seed the damaged fields. But then the weather gradually improved with some fantastically warm and sunny days on which visitors could enjoy their visit. So it was all looking good for the Museum’s popular Enchanted Evening event, when low and behold, the heavens opened for the duration. But that is British weather for you and the many brave visitors still enjoyed themselves. So what about the main event of the spring when we are all cheered up after winter by frolicking lambs being about the Museum? Visitors, staff and volunteers alike were disappointed that there were to be no lambs this spring. Spare a thought for poor old Daryl the ram who did not have the autumn he expected! But sound operational reasons meant it was not practical to manage lambs, but they should be back next year. And Daryl? He has been kept occupied by his two (delinquent) sons from last year’s lambs that have been practicing challenging to become top ram in the paddock. 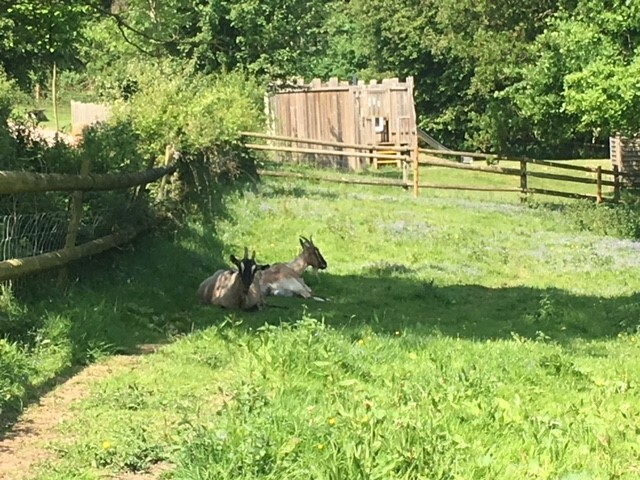 However, there was good news on the animal breeding front as the goats, Crystal and Beverly, are expecting kids due anytime from late May. This was the result of the girls having been sent away for their first goat 18-30s type holiday during the Christmas and New Year period. Goats can have up to three kids, so there could be six. 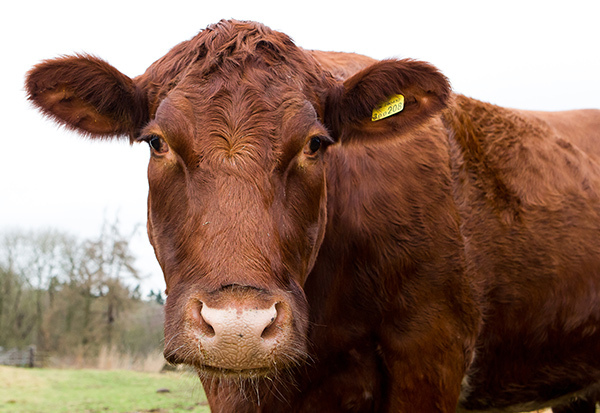 Three to four healthy animals is more likely and would be ideal. 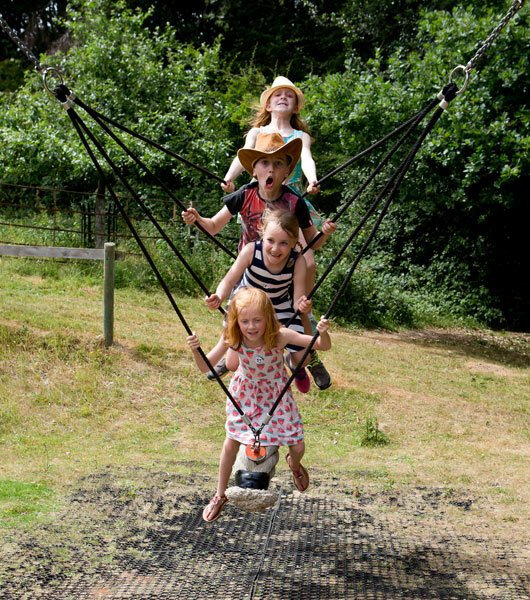 However the thought of three additional Crystal offspring following in their sometimes feisty mum’s habit of butting the daily goat walker could liven up the routine even more! 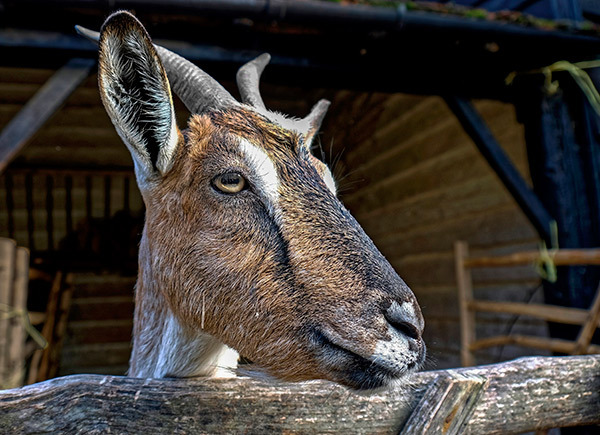 So keep an eye on the Museum website, Twitter or Facebook for news of the goats. And come and visit the Museum farm to meet them once they have arrived. So whilst the goats have experienced the ups and downs of mothers to be, the ewes have enjoyed a more relaxing winter for once. The new calf you may have seen last year has settled in well and is now nearly as big as Clementine. The harsh winter affected them as snow and strong winds caused damage to their temporary cow shelter with the tarpauling roof being literally torn off on occasions. A more permanent shelter is another project for this year. Some tree damage also added to the additional winter work, but on the positive side, this provides material for use around the Museum, particularly for firewood. One of the planned winter projects was to start coppicing and woodland clearance work. Hazel close to the Iron Age building has been coppiced and the materials used to repair the fencing around it. This has opened up the view across the woodland, where other coppicing and clearance has started and will be progressed next winter. 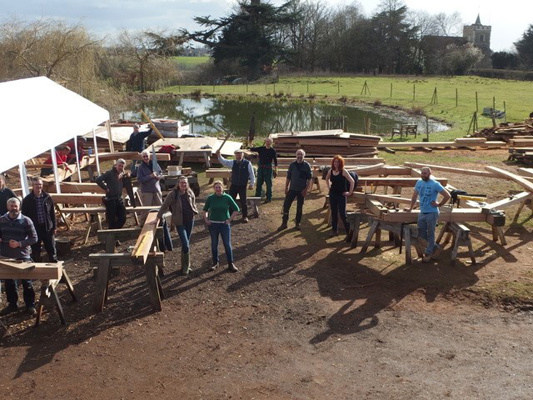 Work has also started on developing the ‘bodgers’ area in the woodland near Aborfield Barn to showcase more green woodworking facilities and the area will feature in this summer’s Rural Life event when traditional woodland crafts will be demonstrated. Let’s hope for a pleasantly warm and sunny summer for visitors to enjoy the Museum. Just a little rain for the grass and crops though please! 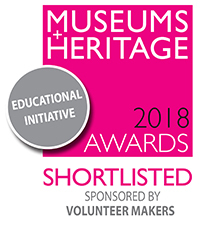 We’re really excited to have been shortlisted in the Museums + Heritage Awards 2018, under the Education Initiative for our literacy theme days for primary schools. In our industry this is the equivalent to being nominated for a BAFTA, so we’re very excited and very proud of our team. We’re shortlisted with some really big names including: Leeds Museums and Galleries, Shakespeare Birthplace Trust, The Royal Parks, UCL Museums and Collections and Yorkshire Sculpture Park. To develop our literacy theme days we used the Talk4Writing approach. We focused on set texts (Wolf Brother, Goodnight Mister Tom and the Little Red Hen) which we then brought to life using characters (both actual and inferred). 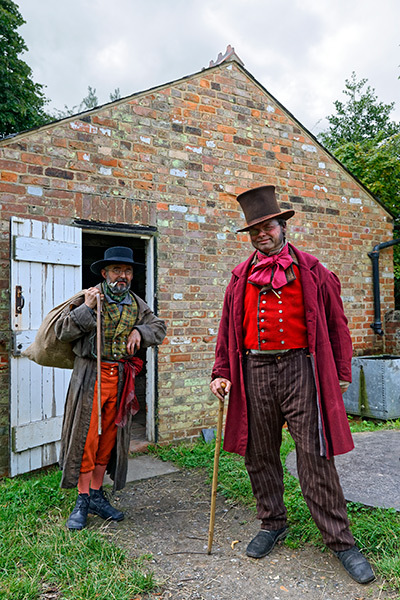 During our theme days children meet these characters, interact with them and re-live aspects of life ‘in the past’ within the story context. Our collection of historic buildings and farm provide us with a unique setting to bring these stories to life. 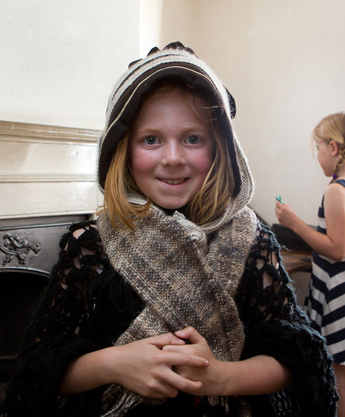 We found that children assimilate real knowledge by experiencing historical buildings with authentically dressed internal spaces: they learn ‘by stealth’ about these different periods in time while interacting with characters from a story known to them. Further details on our literacy theme days can be found here. The winners will be announced at a glitzy award ceremony in London on the 16th May – wish us luck! When I started at the museum, I had hoped to write a blog every month or so to let you all know what I/we were up to. This was seemingly quite optimistic as it has been about three months since my last post! Previously, I told you all about the doors to our Edwardian public conveniences, Caversham. These have since been fitted and I have encouraged all of the volunteers to go and gaze over the fabulous paint job. 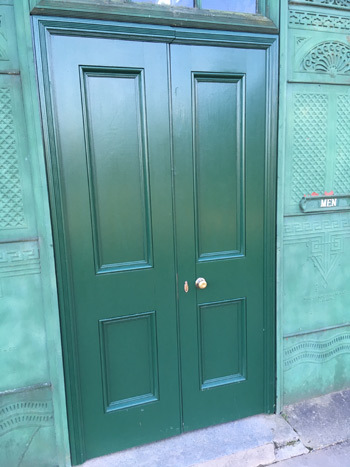 I don’t think they have gazed quite as I had imagined, but the doors are in, they work…mostly…and the rest of Caversham is hopefully going to get a new coat of paint later this spring. I have also gone and completed my Asbestos Awareness training. This will prove to be invaluable when working with our old buildings, and also after I leave the museum, as asbestos was such a widely used material in pre-1919 buildings and continued to be used in construction up until the end of 1999. Since starting at the museum I have put some thought in to what I want out of my time here and what I have to offer the team. Having been very focused on more of the structural side of heritage buildings, I decided to take a look at some of the decorative disciplines within the industry. From the end of November, and every Tuesday for the following 3 weeks, I spent the day with the team at Chapel Studio in Hunton Bridge. 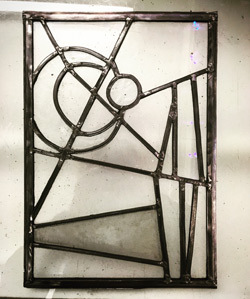 From my first day I was well looked after, fed chocolate whilst listening to Christmas songs, and introduced to the techniques and methodology used in making stained/leaded glass windows. To start with I was offered the use of the clear glass. Given the prices of some of the coloured pieces, I was more than happy to stay away from those for a bit! 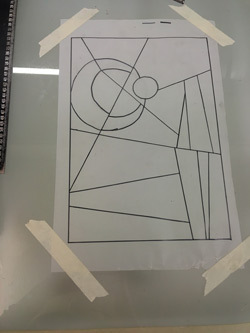 Step one was to create a template. I was advised to include both straight lines and curved lines to get used to using the cutters and this is the product of that lesson. I had to amend the initial design slightly as I had neglected to take the thickness of the lead into consideration. Step two was to select my glass and cut it. Although all of the glass I chose was clear and not coloured, I spent time choosing different thicknesses and textures. 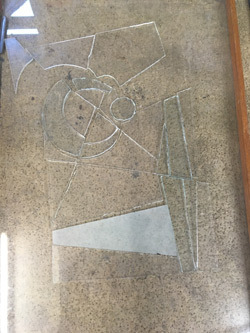 I ended up with a piece of frosted glass, some thick, modern, flat glass with a green edge, pieces with an embossed pattern on one side, and some very thin, delicate fragments with small air bubbles in. After cutting the glass, the third step was to start leading the lights. This was a bit trickier than I had imagined and really showed the accuracy, or inaccuracy, of my cutting skills. 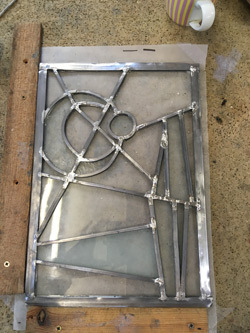 Once the lead had been fitted to the glass, and I was happy that it represented the template precisely, they were soldered in to place. This, obviously, is a vital part to get right as the risk is of the panel falling to bits under its own weight. I’m proud to say that this was executed almost perfectly! Although they could all have done it a lot quicker than me. After four days with the team, this was my finished product. I am very pleased with how it turned out and especially how much I leaned in those few days. 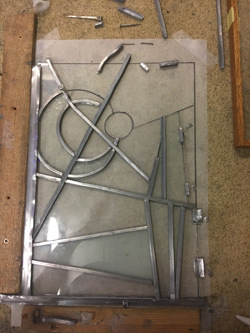 The very specific and different stages that make up a leaded glass panel was interesting to discover and the labour that is required to make from new but also restore existing windows was not something I had really appreciated. At some point soon I hope to return to learn some more about the techniques and methods used for painting the details on to glass panels. 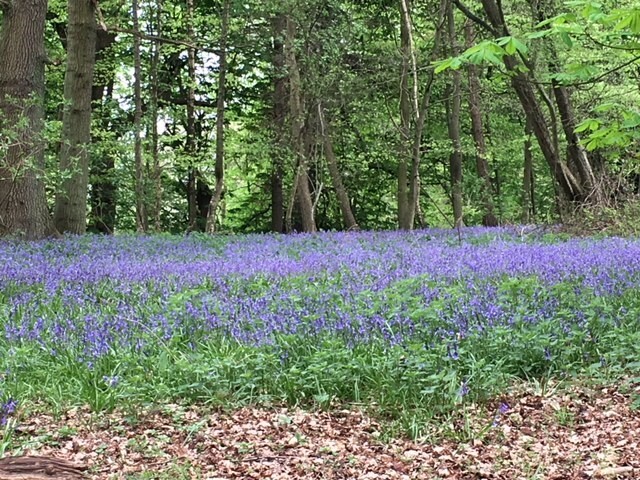 Just after my final day at the studio in Hunton Bridge, I returned to the more structural side of heritage buildings and made my way to a woodland just to the South of Cambridge. Here I helped a team of four collect the last few elm logs for the building of a timber barn. This was hard work to say the least and I was grateful for the buckets of tea that were supplied. After a morning collecting timber, we headed back towards Welwyn Garden City where the brick plinth for the barn was in the final stages. 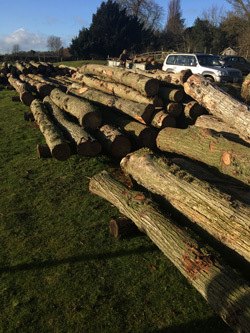 Here our logs were added to the huge piles of previously acquired elm and larger pieces of oak, all of which are to be converted towards the end of February for use building the barn. The main reason for my attendance here was to have a go at bricklaying and help with the brick plinth. 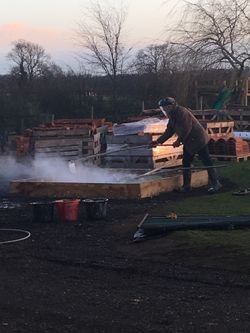 I laid a few bricks while I was there and some of the other members of the team continued to mix lime while the sun set. 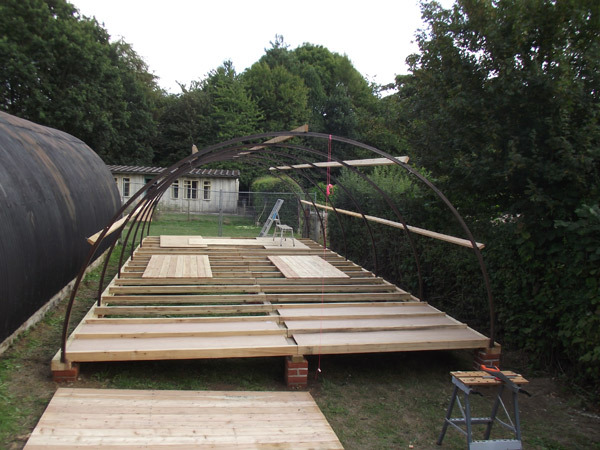 Here at the museum, we have continued to make some headway with our current project, the new Nissen Hut. Before Christmas the templates for our panels were being made in the workshop, and this year already we have stormed through 11 of the 16 floor panels. 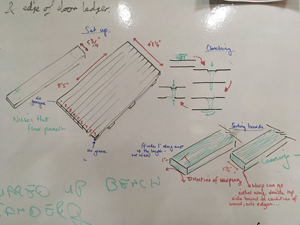 As with some of the previous projects, I have enjoyed drawing pictures on our whiteboard to try and keep all of the volunteers up to speed with the current part of the project. Here is my attempt at illustrating the many components of the floor panels…there is quite a lot missing still but I ran out of space. 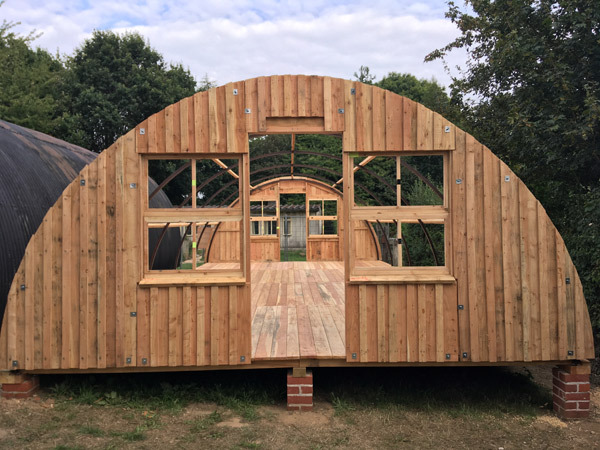 Each semi-circular end of the hut is made up of five main sections: the central part of which contains the door, the sections containing the windows which flank the door, and the smaller panels on the outside edge. These outside edge panels, four all together, have now been completed. Remove excess sawdust, residue and resin from both sides – this can affect the machinery that we send the boards through and also give inaccurate readings for measurements if not removed. 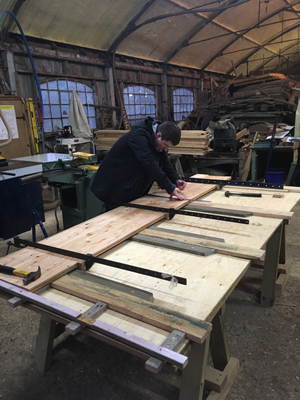 Check that each board is over 1” thick along the majority of the length – as the boards need to have a smooth, planed side, they need to be over an inch so that they can be planed to the same thickness. Cut each board to 5¾”wide – each panel consists of nine boards, 8 of which are this width. Check the grain for direction of cupping and determine the topside of each board – the boards are being placed on the panels so that any distortion lifts in the centre, rather than at the edges. 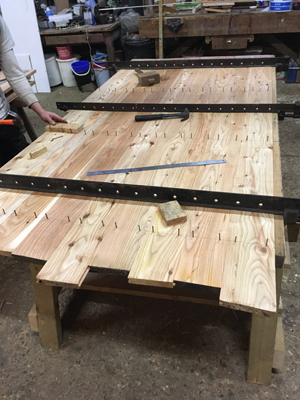 Send the board through the planer/thicknesser, topside up – this gives a smooth top surface and makes all the boards the same/correct thickness. Create the tongue and groove – this entails sending the boards through the machine three times. Fit the boards to the panels. For the 16 panels, this process has to be completed for each of the 144 floorboards! 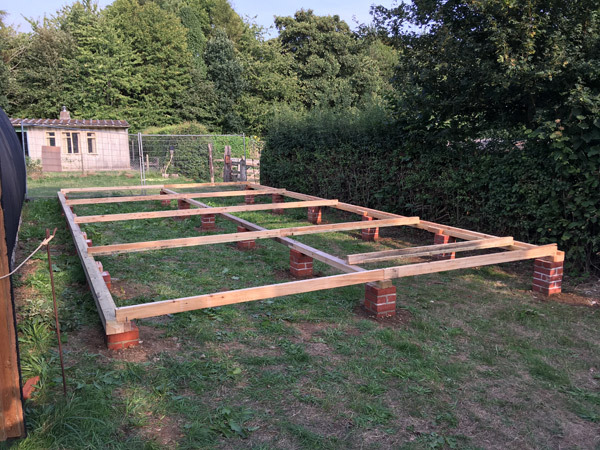 Once the floor panels are finished, there are six more panels for the end walls to be completed, the ribs still need to be modified, the brick piers have to be built, and quite a few more bits and pieces….more to follow in later updates. Over the next couple of months, I hope to explore the decorative side slightly more by visiting a local wood carver. 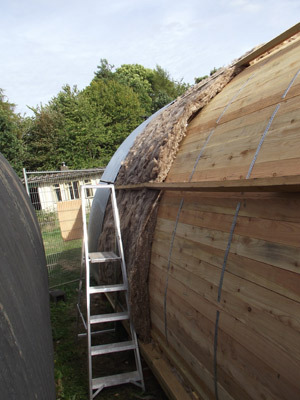 I have also booked a week to help construct the elm barn by Welwyn Garden City, and I am looking at further framing courses at the Weald & Downland museum to broaden my understanding. 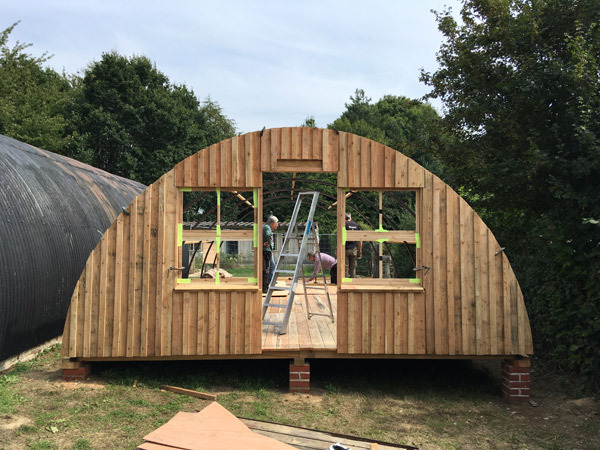 The Nissen Hut is due to be finished and opened this year so I will be continuing to help with that along with the scheduled maintenance on the other buildings. As you may have guessed from the blogs title, there is something I have become very fond of whilst being here at COAM……. TRACTORS! 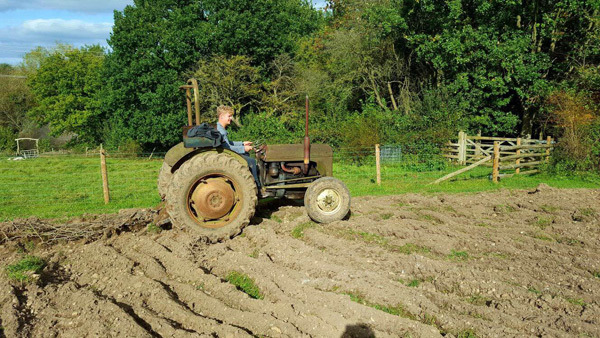 Having very limited experience on tractors, but a keen interest since from when I can remember, I made a tractor driving course high on my priority. I attended a two day course at the Royal Agricultural College in Cirencester were I obtained my tractor driving and machine handing certificate. With my main interest in tractors of an older generation I was much unprepared when meeting what I thought was nothing short of a spaceship. Fortunately my instructor on the course was also interested in older tractors and would often refer to them during the training. Over the two days I was able to understand the controls needed for most jobs from simple driving to using powered implements on the PTO (power take off). Since then I have been very fortunate to use my skills during the process of planting of this year’s wheat. 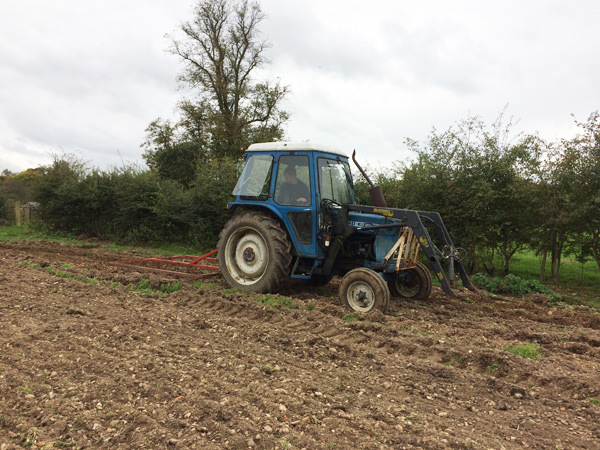 I was able to use a harrow after it had been ploughed, which is essentially breaking the bigger clods of soil into smaller ones. 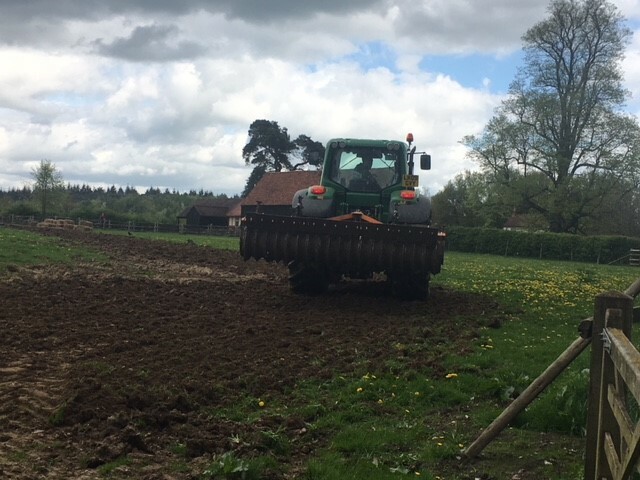 I was then able to harrow after the wheat had been sown to disperse and bury it and then roll it to complete the process. A personal favourite of mine is the Fergusson TE35 we have on site. A brilliant little tractor and a real classic example of extraordinary agricultural engineering of times gone by. 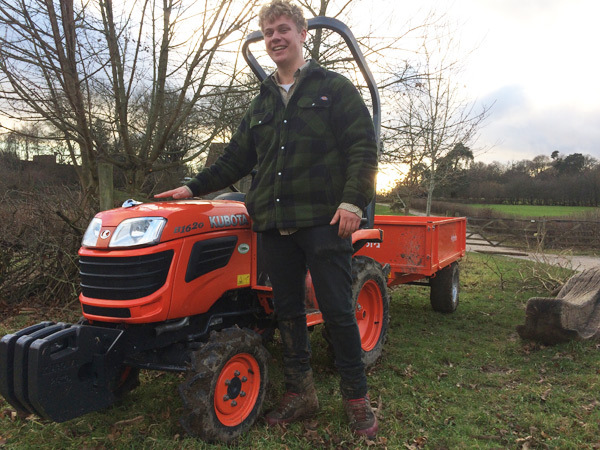 A new additional to the farms supply of work horses is on the small size, in the shape of a Kubota B1620 which at its rather “cute”, size its ideal for jobs like getting through the woodlands narrow paths and transporting fire wood. A handy extra is the tipping trailer which we brought with it, meaning we can load and tip all sorts of things from brushwood to gravel. I really do appreciate how vital a tractor is to running a farm, especially when seeing Rob working the heavy horses on site. It’s a reminder of the extraordinary extra amount of work that was involved before the introduction of tractors. 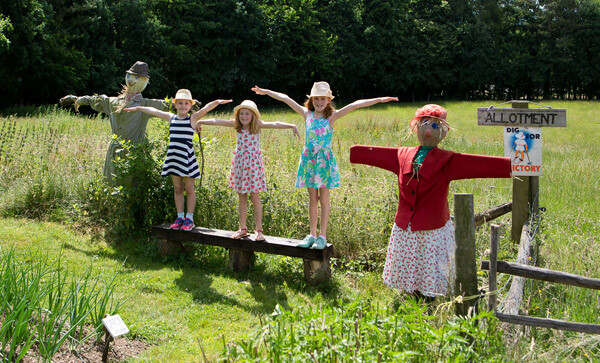 The Museum has seen an increase of over 90% in visitors over the last 4 years! 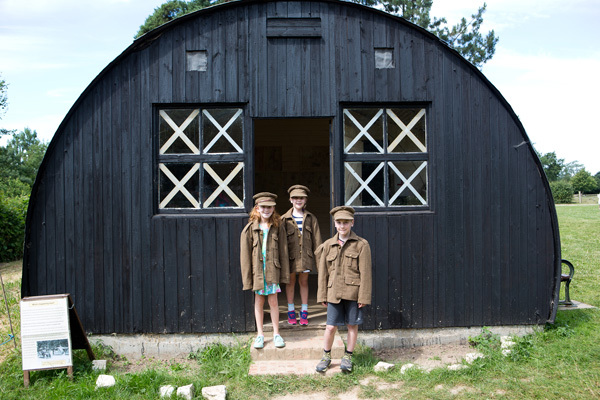 Over 21,000 school children visited the Museum for school workshops in 2017. The Museum has over 200 active volunteers and we couldn’t run without them. The Museum has 14 buildings in store waiting to be reconstructed on the site, we just need to raise the funds so that we can do this. The 14 buildings in store are all stored flat packed within Glory Mill, which is one of our historic buildings. It’s like our own historic Ikea! The Museum is a charity and any profits go back into the Museum so that we can continue the valuable conservation work that we do. The Museum currently only has 7 full-time members of staff, 8 part-time members of staff and 2 Heritage Lottery Funded trainees. Due to the increase in visitor numbers mentioned in point 1, this will be changing for 2018 so keep an eye on our vacancies page if you’re interested in joining our team. 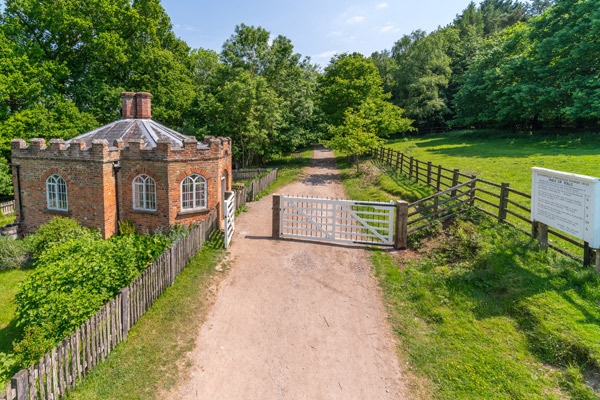 The Museum’s farm was used for filming in series 2 of Downton Abbey. The Museum has been used for filming 35 TV programs/dramas/films since 2011. Our buildings are named after the place that they were rescued from. Things have been settling down on the Museum’s farm since the summer although the harvest and Halloween events kept the COAM team busy. The new Farm and Site Manager, Alaric, is settling in well and formulating some exciting plans for the farm, meadows and woodlands for the future. It has also been quiet, not literally though, on the animal front with no recent comings and goings. The calf is growing up quickly and the lambs are now almost indistinguishable from their mothers. Daryl the ram has gracefully accepted, if you can use graceful when referring to him, the two ‘trainee rams’ from this year’s lambs. Although still top ram, the trainees are getting noticeably more assertive but accept being put in their place by Daryl. The Old English goats continue in their unpredictably eccentric and often amusing behavior – that is as long as it does not involve horns and walks! They have been enjoying the meadow next to the Toll House since mid-summer. Its fallen tree provides a great climbing frame and the variety of vegetation provides much to munch. The morning walk from their night time farmyard quarters to their field is now often a rush to get there quickly. This does not however help with the route hedge maintenance leaving more for the staff and volunteers to do. But it does reduce the time and opportunity for them to misbehave on route. One of the bigger events of the year for the farm is the Harvest Festival weekend. The 1940s threshing machine was dusted down and carefully prepared by the farm artefacts team for demonstrations of how the harvest was done in the past. The nearly as old Fergusson tractor was set up to provide the power to run the thresher and the recently restored binder linked up to the reverse of the threshing machine. 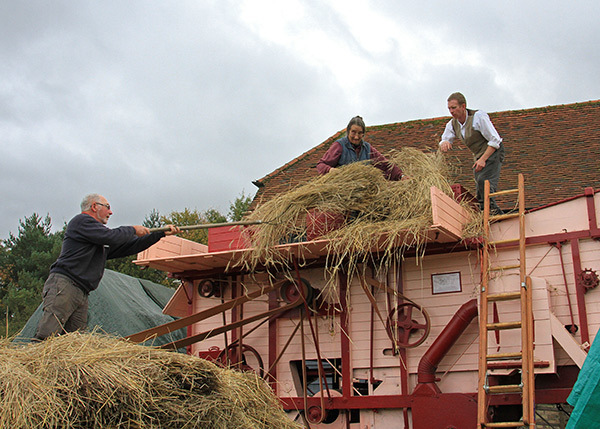 Visitors who attended one of the two days were able to watch demonstrations of how the threshing was done from the days of steam through to the 1950s. Stooks of wheat prepared in the fields when harvested were fed into the thresher to separate the grain from the straw. The grain is sacked up whilst the straw was deposited into the binder. Halloween has become the finale of the Museum’s season and is the busiest event of the year with 2000 plus, mainly young visitors descending on the site during a madly exciting few hours. The evening is a hectic and stressful time for staff and volunteers. However it is worth it for the pleasure it brings to many of our more junior visitors who have a great time enjoying the crafts and experiences of Halloween, as well as many tasty treats whilst also being scarred witless, along with many parents it has to be said, enjoying the scary walks. The farm team have responsibility for preparing the spooky walks as well as getting the barns ready for activities. The animals also have to be moved to suitable locations where necessary as the object is not to spook them! So after the excitement of Halloween, a calm of sorts descends on the Museum with only the educational groups of school children continuing to visit for another month or so before the Museum’s final event of the year, the Victorian Christmas on 2/3 December. It will not be quiet on the farm though as there is much winter work to be done before the Museum fully opens next spring. Hedgelaying will resume as wildlife dictates that this must be a winter activity. There is work to be done in the woodlands including path scrub clearance and maintenance ensuring a safe passage for visitors. There is also plenty of scrub and tree clearance to be done in other parts of the woods. This is a necessary part of woodland habitat management and will also allow more suitable tree species to be planted where appropriate. This type of work is time consuming and cannot easily be done with visitors present. 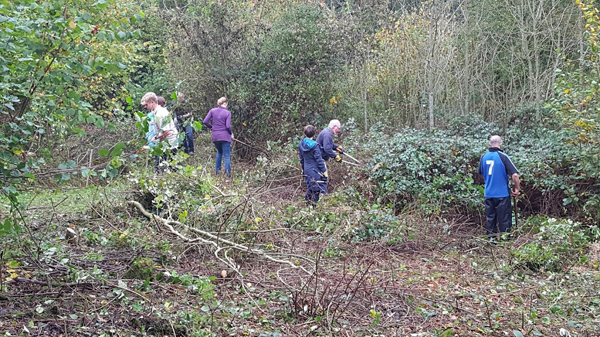 The farm team were recently helped by an enthusiastic group of volunteers from Robert Bosch who swapped their desks for a day in the fresh air to help start the clearance of a large area of scrub. Even with heavy rain stopping play for an hour or so, they achieved a lot which has been a great help. 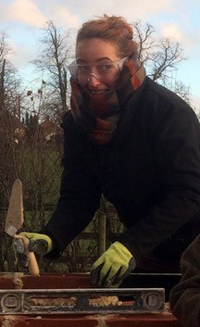 So when you are warm and dry inside your workplace, school or curled up at home during the day in front of the fire, just bear a thought for the farm team who will be hard at work outside in the cold and wet this winter – loving every minute of it!